When I got to Herbalife, I was faced with a reactionary culture. We were designing things because “someone high up said to do it”. We were stuck in design churn loops, often times making 8 or more prototype iterations before developing. This wasted precious resources and time (oftentimes 6 months or more). Very little thought was given to real user need, if these requests were anecdotal, or if we were solving the real problems. 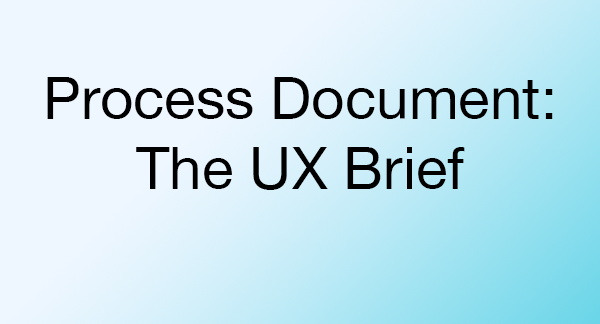 I introduced the UX Brief document to facilitate conversation around the problems our users face. No UI, no solutioning, just talking about the problems from various lenses, and why they are problems. This builds consensus earlier in the process, which lead to less requirements changes, less iteration churn, and an overall more thoughtful and intentional design. The PRInCiPleS Framework for Design Plans & Explanations. A full paper with example can be found here. This is intended to be used at the start of the project to gain an understanding of the project. This is by no means rigid. Adapt it to the individual project. I also have an example of an ongoing UX Brief. know it is a problem? What evidence is there to support it is a problem? context? Can you describe that context? Here are some questions to ask at the kickoff meeting. • What do we know? • What do we not know? • What are your assumptions about the project? • Who are the users? • What are your assumptions about the users? Insights are the design issues that arise out of research. Here are some questions to ask once research is synthesized. • What did we learn? • Does more research need to happen? • Is this still a viable project? • What is potentially challenging? • Are there any gaps? strategies that we envision in response to insights. What type of prototype is needed?